Most people today remember the First World War as the first mechanised conflict. However, despite the advent of other means of locomotion and provision of power, when war was declared on 4 August 1914, there was no question of Britain’s war effort taking place without extensive equine participation. During the war eight million equines were killed and in varying degrees, (depending on their respective geographic distribution), the horse, mule and donkey can be seen to have made a vital contribution. including the story of Norman Woodcock and his horse Timbuc, as told by Norman’s granddaughter Susan Burnett in her book ‘On That Day I Left My Boyhood Behind’. 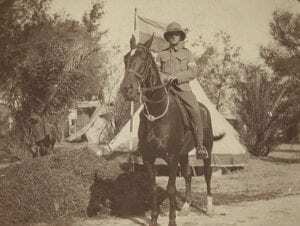 Norman joined the Royal Signals and travelled to Gallipoli, Egypt, Libya, Mesopotamia, Palestine and Syria before returning to the Western Front in the final weeks of the war. Norman was accompanied by Timbuc throughout the war. The project therefore had a dual focus: the geographical spread of the campaigns in the Middle East and the role that equines played in the war, not just as draught horses and cavalry chargers but as companions for the soldiers they supported. We worked with the Minehead Quilting Group, led by researcher and quilter Jane Sharp. The group researched Norman and Timbuc’s story and the wider history of equines in the war away from the Western Front. The quilters made a large banner illustrated with scenes based on first hand accounts of the war in the Balkans and the Middle East. In addition to the banner, two exhibition panels explain the design and context. This is being taken to conferences, family history fairs, lectures and remembrance events around the country.